Remember my trip to China and how I wrote out a blog series about Why I Blog?! I need to get it off my chest today. I have done lots of studying into how people grow their blogs. I have asked successful bloggers. I have read heaps of articles. I have studied those people who seem to be doing something right. One thing that really seemed to stand out to me was this. said she responds to each and every person who comments on her posts. Seriously?! This is impressive beyond belief as she regularly has well over 50 comments a day. Wanting to show an interest in the lives of her readers. To build that relationship with them. So I told myself, I can do that. Especially if it grows my blog. And thus began a commenting marathon. It didn't take long before I had this epiphany. What if I am commenting back to every single person . . .
or because they know I will be hopping right over to say something to them?! what happens when life gets crazy and I can no longer keep it up?! Will this 'community' of friends suddenly disappear? Journaling about this life Husband and I are creating and celebrating the gift it is. Sooo o o o. . . I came to this humbling decision. I choose not to operate my blog this way. I choose to focus on building a genuine community of friends from this blog. However and in whatever way this happens. I choose to allow this blog to grow as slowly or as little as it naturally will happen. I choose to make my Husband and my family my first priority. I choose to live to the fullest and allow those outpourings to be reflected here. I am NOT judging anyone who chooses to operate their blog differently. I am NOT bashing said successful blogger for her personal choices. I respect and admire those. I am NOT saying it's wrong to actively focus on growing your blog through various methods. I am NOT saying I only want to grow a blog with zero relationships. I am ONLY sharing my own heart and desires for my OWN blog. I AM inviting anyone to join this blogging community I am creating here everyday. I AM inviting you to comment and interact as you will. I AM inviting you to follow me on Twitter so we can stay easily connected that way. Dude. It is my new favorite way to have conversations with you lovelies. I AM encouraging each of you to remember where your first love and time belongs. Our families and friends real. More than a web page that will someday be gone. Thus ends my words. All 2349063 of them. or maybe just make myself something yummy to eat and then go for a run. Happy Monday to you, Lovelies. I love this post! It was really helpful to me as I have a lot of the same thoughts you do. Thank you! i think everyone struggles with this. I think it's really helpful to think about it in this way. and I think you've made a very good decision. I have the exact same feelings! I want a TRUE community of bloggers, not people who comment on my blog because I comment on theirs. I struggle with that too because I want to grow my blog! <3 your blog, for who you are and your life! I'm totally in the same boat. I used to be on my blog ALL.THE.TIME. but then went on hiatus for about 6 months because I wasn't sure why I was doing it anymore. I have to remember that I blog because I love it and have something to share, not because I want to be super successful and be invited to NYFW. Although, if given the opportunity I would def take it. (I'm not gonna lie.) But I want to be genuine and real, first and foremost. And yes, family and friends, REAL friends are what matter most in this short time we call life. hey :) I chose to run my blog that way too. i don't want to "waste" my life in the blog world, i want to learn from the blog world and live in the real world! PS: even if you never respond to me, i love reading your blog. I completely agree with everything you wrote! Can I offer a suggestion for commenting? Because I reply to all my comments too. If you link your email with your profile, and when you get a new comment it goes directly to your email. All you have to do is respond via email. 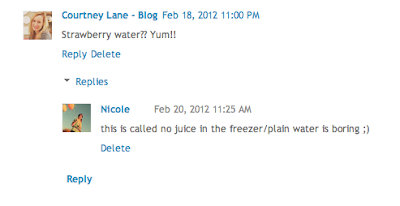 At first, I was replying right under the bloggers comment and realized they weren't coming back to read my response. So another blogger told me that linking your email and responding via email is so much quicker and more personal. You may already do this, but I just wanted to shed some light in case you didn't know, because I definitely didn't know about it till someone told me! I go back and forth between this sort of thing so often - I get into a rhythm of trying to thoughtfully leave comments on everyone and their Mother's blog, and then I go through phases where I think, if you don't have time to comment on every single blog it's ok, this blog is for you, a place for YOU to document your life so you can create a cohesive story for your children one day. Great post Nicole! I feel the same way..I do try to respond to peoples comments in my gmail account, but thats when I have time. Sometimes it will be 4 days later and im just getting back to them to say thankyou! Still, im sure its appreciated. I didnt used to do this, just kinda started one day. I fully agree that our families and priorities need to come first, the blogging world can wait..and I think thats a great choice on your part : ) Your blog is great to read! I just love this post and I just love your blog! And I love writing (...) mine. Real life is lovely. Sometimes I get all twisted 'round and start to feel bad for not giving enough time to "blog work" or whatever it is. And then I get reality checks, like what you wrote today. It's good stuff. Thanks for that! We should be friends. great post :) I'm trying to keep my priorities straight too-can't miss my baby boy growing up! AMEN. and amen. i just love this!! okay PS are you going to be in china this summer with BMH because we are?!?! This post is so refreshing and I really respect what you're saying. I've been blogging for a few years and never put it out there until I recently started commenting on other blogs. I think it's so important to be genuine, honest, and find blogger friends through mutual interest. It's great to read your thoughts! Genuine, honest, not just "follow-me-back" comments mean so much to me as a writer. I love it when other bloggers/writers/readers can identify with me. Such a sense of community! I totally understand what you mean by spending too much in the blogging world...how your real world can start to disappear, how you can worry that you may not be able to keep up with it. I have to say that my commenting habits and "linking up" habits are directly related to the kind of day or week I'm having, because I do have a full-time job. It's certainly a balance that's tough to find. Thanks for being honest! I still love you! Just post good quality stuff and connect with the people who reach out and you are good to go! What a wonderful post. I truly enjoyed reading this. And thank you for commenting on my blog and leading me to yours. So glad I found it. :) I'm a new follower. AND, real life is better + pretty much rocks. I love this one of the reasons I started blogging was to meet new people. I have two close friends an amazing Best Friend but sometimes it is nice to know there are other people out there you can connect to as well. I wanted to share my life and my love for the Lord but I wanted to also touch other people's lives and grow friendships with people. I totally feel you. I think most bloggers do at some point. Either way, I'll continue to follow your lovely story. I truly enjoy reading your posts! Your post are so inspiring when I feel like giving up on this thing. Thank you! Nicole! Please get instagram, and thanks. what a good post about putting things into perspective. i like what you said about looking back and time spent responding or commenting and making sure that is how you want to use your time. there are some many things i want to do with my time i have a hard to prioritizing it and not trying to fit it all in. I want to work on doing things, taking my time, so that I truly enjoy them. thanks for this. I love the heart behind what you are trying to do. Thanks so much for putting this out there. I too desire true community from this, because otherwise it is pointless...isn't it? I guess blogging just wouldn't really match up with the rest of my life if it was any other way. I haven't really found my feet in this area. I guess I need to keep working on that. Thanks again for sharing. I really needed to hear it from this perspective. What a wonderful post. I truly enjoyed reading this. And thank you for commenting on my blog and leading me to yours. Castle Hill driving school.